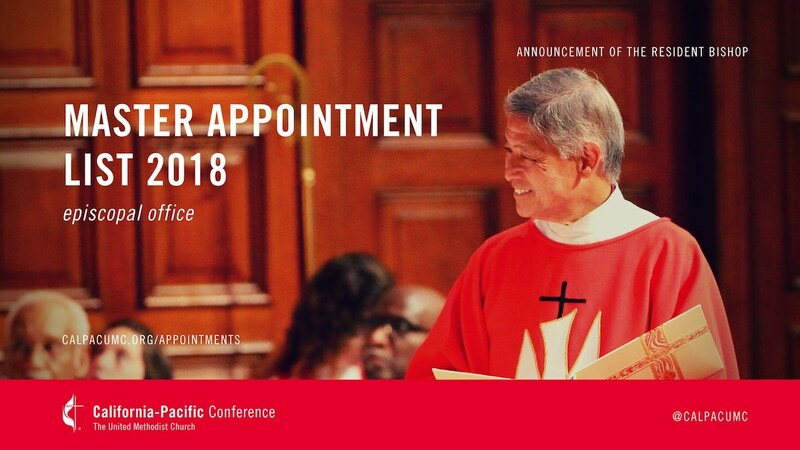 As the Bishop and Appointive Cabinet of the California-Pacific Conference, we would like to continue the practice of posting our clear appointment openings. We have received positive feedback from this process, and people feel there is a stronger sense of transparency and collaboration in the appointment process. As we begin the appointment process, we usually start with those churches in need of a new pastor through a retirement, ending of an interim period, or a change in status of the previous pastor. We know that a set group of churches will need a new appointment. We have listed below those churches with brief descriptions of their ministry settings. Specific statistics about the churches are available through the Annual Conference Journal, and demographics of the surrounding communities are available through MissionInsite. Clergy members interested in putting their names forward for specific openings should contact both their current District Superintendent and the District Superintendent of the district with the church opening. In some cases, it might be the same D.S. who supervises both appointments. As a courtesy, if the D.S. is not the same, notification to both is required. There is absolutely no guarantee that the clergy member will be selected for an appointment based solely on the request, but the Bishop and Cabinet will deeply discern the gifts and graces of the clergy members putting their names forward, and the needs of the mission fields and the local churches. We are committed to making appointments based on the match between what is needed in the local communities and churches, and the gifts and skill sets of the potential pastors. This initial list of clear openings will be posted one time. There will be no additional postings as new appointments become available through movement of pastors to new churches. All inquiries will be held in strict confidence. Pastors wishing to put their names forward are not to contact their own local churches, nor the pastors or laity of the churches in which they have interest, as this has the potential to harm their current church appointments. The Cabinet will not release any information regarding those who put their names forward. We do ask that clergy who plan to put their names forward to enter into a deep and prayerful discernment before contacting the District Superintendents. One should only take part in the process after a careful consideration of where God is leading one to consider, and be affirmed by God that this is both realistic and a true calling. For those the Cabinet eventually asks to move to new appointments, we are committed to providing the specific reasons why we are asking for this new opportunity. As mentioned earlier, the Cabinet will deeply discern the match between mission field and local church, and the gifts and graces of the pastor asked to serve. There will be the expectation of a complete rationale of why we believe this match is necessary. There is also the expectation of an open itinerancy, and if one cannot move because of grave family issues, we will enter into a “covenant of limited itineration,” whereby full time appointment may not be granted, as we see what is available in any given local area. We hope and pray that this way of appointment making will continue to be both liberating and helpful to our annual conference and God’s Kin-dom that we are pledged to serve. Ala Lani UMC of Kahalui – (Average worship: 132) Ala Lani UMC has been growing in the last two years and has potential for continued growth as the church is financially secure with a vision for current and future ministries. The pastor must have a deep cultural understanding between ethnic groups and have compassion to work beyond cultural boundaries. The church has a dynamic, dual language ministry: English and Tongan. The congregation needs an energetic and compassionate leader who can help with ministerial growth and foster a strong relationship between the two ministries. The pastor must also have solid administrative and preaching skills. Holman UMC – (Average Worship: 550) Holman UMC is a “flagship” United Methodist congregation that is widely recognized among African American communities locally, regionally and nationally. It is actively engaged in the community and has a Sunday morning broadcast ministry that reaches across the Southern California area. Church membership currently is 1500. Belmont UMC – (Average Worship: 74) Belmont UMC has a 100-year presence in this historic Long Beach neighborhood. The church has an active pre-school and is located in a residential neighborhood while also bordering a rapidly developing commercial area. Church membership is 106. Glendale First UMC – (Average Worship: 220) This historic United Methodist Church sits in the heart of Glendale and has been a huge presence both physically and spiritually for many years. With changes in the ethnic makeup of Glendale and post-church culture, G1stUMC has increased its mission work, however, this is the time for new hospitality and new ministry to begin. The front walls are coming down, literally, and the courtyard will begin to invite others to join in. Lancaster UMC – (Average Worship: 230) The LUMC is located in the older part of Lancaster in the sprawling Antelope Valley. The LUMC has a multi-cultural ministry emphasis with language ministries serving the present Hispanic, growing Chinese, and smaller Japanese communities. In some ways, this is an inner-city church. The older English-speaking congregation is seeking to find connections with younger adults, but is beginning to connect with younger families and rebuild their preschool. Atascadero UMC – (Average Worship: 150) The Atascadero UMC is located in the countryside just outside of the small downtown Atascadero on the Central Coast of California. With recent growth in children’s and youth ministries, younger families are beginning to participate in the predominately Anglo, yet theologically diverse, congregation. Being a Reconciling Congregation in the midst of a politically conservative region means that AUMC is reaching a population of LBGTQA+ persons, as well. Estero Bay UMC – (Average Worship: 56) The Estero Bay UMC is located in the Morro Bay community in a residential area. This small population is made up of a variety of persons from all different socioeconomic levels, all living in an isolated region of central California. With an elementary school located next door, the potential for an expanded family ministry has always been desired. However, the EBUMC is currently mostly middle-aged to older adults. They are identified as a Reconciling Ministry and work at welcoming all persons. Moorpark UMC – (Average Worship: 50) The Moorpark UMC is located in a residential community of Hispanic families that is surrounded by some of the affluent communities of Ventura County such as Moorpark, Simi Valley, and Camarillo. Their highly rated preschool caters mostly to Anglo families and many of their church families drive in from these outlying neighborhoods. Worship includes excellent music and their ministry is mission-focused. Now is the time for community engagement/discipleship. Chatsworth West UMC – (Average Worship: 42) A group of senior members makes up the Chatsworth West UMC. They are a multicultural congregation including 50% Japanese, 25% Anglos, and a variety of other persons from Africa, Asia, and South America. Their main mission is the “Partners of Hope” food pantry and they are in partnership with other ministries of the San Fernando Valley Mission Area. God’s preferred future for CWUMC needs to be developed in the coming year. Claremont UMC – (Average Worship: 200) This United Methodist Church has had strong ties to Claremont School of Theology and has been a strong traditional worshiping setting with very progressive theology and strong social justice outreach. They have received national attention for their creative and prophetic nativity scene that addresses current social justice issues. This high energy congregation has very strong lay leadership and is exploring new ministries. They are experiencing a growth in families and discovering a worship that is liturgically based, playful and creative. They seek to make spirituality accessible to visitors and people new to the faith. Whittier Evangelical UMC – (Average Worship: 27) This United Methodist church is one of our theologically conservative congregations. It is in a residential area of Whittier surrounded by a growing Hispanic population. They are looking to energize the congregation and to minister to families in the area as well as continue their outreach to the homeless. San Diego First UMC – (Average worship: 960 – San Diego Main Campus and Waters Edge Point Loma Campus). San Diego First is a dynamic, multi-faceted ministry setting with two campuses. The main campus is located in Mission Valley and boasts a rich music ministry, effective Christian Education and Youth departments, as well as a committed mission focus. The Water’s Edge ministry is located in Point Loma and is a growing new start ministry of creative and innovative disciples. This progressive congregation will require a pastor of preaching excellence, pastoral experience, and honed skills in administration and management of a multi-staff congregation from diverse demographic areas. Community UMC of Huntington Beach – (Average worship: 360) Community UMC is a strong and dynamic ministry setting. Fiscally secure, the congregation has been doing visionary work repurposing their facility to meet the needs of new arrivals to church. Successful new programs such as “Messy Church” are reaching whole new populations through talented staff leadership and committed lay people. In the past three years, worship attendance has grown by 16%. This congregation will need an energetic visionary leader with strong interpersonal skills and broad gives and graces for ministry ready to spend the next 10 years continuing to grow this vital church. We are pleased to announce clergy appointment updates as of January 15, 2019 available via the button below. The Master Appointment List will be updated and posted (calpacumc.org/appointments) as of October 15, January 15, and April 15 of each year to reflect the most current appointment information during the year. Please contact Margaret Irwin (mirwin@calpacumc.org; 626-568-7312), Senior Executive Assistant to the Resident Bishop, for any questions you may have regarding this information.